REYNOLDS APPARATUS for engineering schools. REYNOLDS APPARATUS, technical teaching equipment for engineering -Reynolds's Number is a dimension less number used by engineers to determine type of Fluid Flow and testing on scale down models of airplanes, ships etc. Apparatus consists of a constant head tank and a small ‘dye’ tank. The constant head tank has a horizontal/verticaltransparent tube with a and a flow control valve at the dischargeside. The velocity of water is varied by the flow control valve.When the dye is introduced then laminar or turbulent nature of the flow can be visualized. Sump Tank : 550 X 430 X 225. Flow Pipe length: 700 mm. Measuring Flask: 1 litre. Dye Material : Potassium Permangante. Pump : Submersible type. Piping with necessary Valves and Fittings. Digital Stop Watch with 1/10 second Accuracy. Detailed Technical Manual and On-site demo. 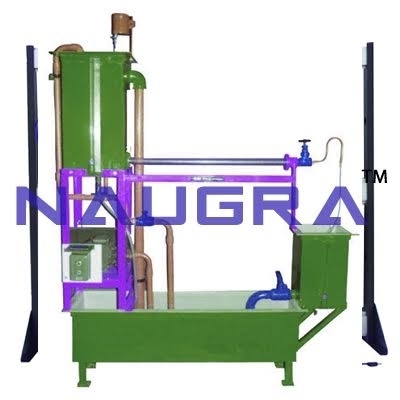 We are leading manufacturers, suppliers & exporters of REYNOLDS APPARATUS for engineering schools. Contact us to get high quality designed REYNOLDS APPARATUS for engineering schools for schools, colleges, universities, research labs, laboratories and various industries. We accept bulk orders for government tenders in all countries around the globe.